GPS is the technology of choice for outdoor tracking of vehicles, assets and staff over a wide geographic area. Where an object needs to be tracked outdoors and also within buildings, then a combined RFID and GPS tagging system can be used as GPS alone does not provide indoor positioning. RFID Centre can provide complete tracking systems including GPS personnel, asset or vehicle mount units and a unique flexible web based application software system called Universal Tracker. Tracking information is made available to multiple end-users over the Internet from a dedicated password protected web server. The system provides control, visibility, security, safety and real-time management of remote resources such as assets, vehicles and staff. The Universal Tracker GPS software can be rapidly configured to represent the key information associated with any object class that your organisation wishes to track – so it can literally ‘track anything’ through one consolidated system. Most GPS tracking systems assume that only vehicles needs to be tracked and so have hard-coded only the handful of fields associated with vehicle information. 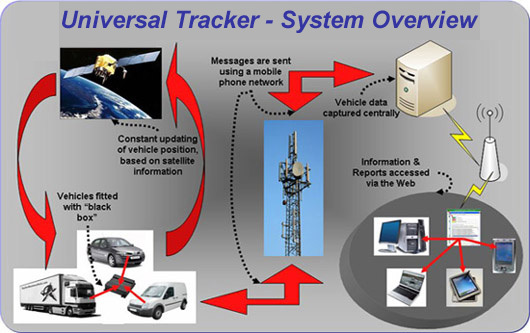 By contrast our Universal Tracker system has been designed in such a flexible way that it allows customers to represent many different mobile object classes or resources such as plant, equipment, products, machinery, containers, consignments, vehicles, loan workers – so they may be all tracked and optimised. The system adopts the customer’s naming conventions, icons and terminology for any object class such that it can be rapidly implemented and instantly understood by staff users.